Hello. 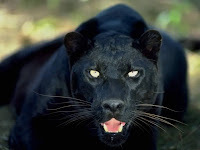 I just wanted to say my mom saw a black panther run across the road in the Plano, Texas area on Monday, July 26, 2010. Please e-mail me if you want more information. All my mother and I know is that the animal she saw was sleek, cat-like, pitch black, and very large. She couldn't see very well, because it was around 9:30 pm, but she swears it was a panther. The street was Windhaven, and it's either in Richardson or Plano. I don't drive yet, so I'm not sure. That's pretty much all she recalls. 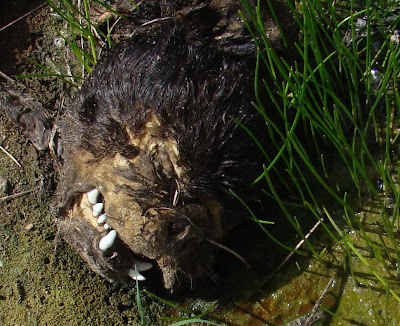 When she got home she called the police and they said that Animal Control was already looking for the beast. I have no proof, obviously, that this event actually occurred as reported but this is far from the first report of large panther-like cats in the greater Dallas-Fort Worth area. The Plano area in particular has been a hot spot for big cat sightings. While most will scoff at these reports, there seems to be a bit of a pattern developing. It is true that these animals are being seen in highly populated areas. On the surface, at least, this seems, at best, unlikely. 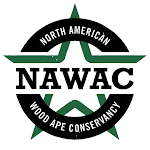 Each sighting did take place in areas near waterways with heavily wooded riparian corridors, undeveloped or agricultural land, or nature/wildlife preserves. This latest report is a prime example of this pattern. Windhaven Parkway is only a couple of miles away from Lake Lewisville and also runs just north of the Arbor Hills Nature Preserve. In fact, Windhaven Parkway actually forms part of the northern-most boundary to the preserve. The section where the Parkway skirts the Preserve also just happens to be the most thickly forested and lonesome portion of Arbor Hills. While this particular section of Windhaven Parkway was not specified by the reader, I'm guessing this was the general area of the sighting. 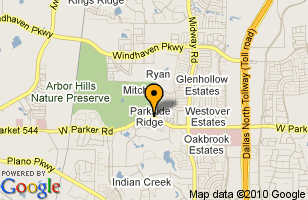 Arbor Hills Nature Preserve is a natural respite within our suburban city. It is a special place left largely undisturbed where visitors can have the pleasure of being surrounded by nature and experiencing animals, plants and ecoregions found in North Central Texas. Portions of the Preserve feature three distinct ecoregions. The Blackland Prairie, Riparian Forest, and Upland Forest are all present within the Preserve. Wildlife found in the Preserve include egrets, hawks, woodpeckers, owls, snakes, turtles, and fish. Small mammals like rabbits, raccoons, and opossums are also present. The City of Plano's sight says that bobcats and coyotes are still present within the Preserve as well though rarely seen. It is entirely possible that we have a case of mistaken identity. Maybe the reader's mother saw a bobcat cross the road. Bobcats can get pretty big after all. The witness admits it was well into the evening and visibility was not good. The reader also mentions he is too young to drive. Maybe this is just a teen having some fun at my expense. While I didn't get the feeling this was the case it is possible, I suppose. Still, according to the reader, his mother was adamant that it was a panther. A pitch black one at that. Something else caught my attention. The reader said that his mother reported the sighting to police. The response to her report? The police said they were already aware of the situation and Animal Control was out looking for the cat. If factual, this would lead me to believe others had seen the animal and reported it. Again, I can't verify any of this but the pattern seems to be holding up. Fortunately, I was able to attend the Lufkin meeting. The meeting started about 6:10 PM with introductions and a very informative overview regarding the "Wild and Scenic River" act. This presentation lasted 10 - 15 minutes and included a "public apology" regarding incorrect information provided in some of the handout information. The rest of the meeting was devoted to questions and answers. There was some "tension" on the part of several of those asking questions and I would rank the overall attitude of the audience as a mixture of disgust, disdain for federal involvement, and anxiety due to expectations of further loss of Texas/local control. First pop out of the hat, the first "question" identified the simple reason most folks were attending the meeting. No more dams - simple as that. Additionally, no other control of the river was wanted or invited! No one offered support for further damming of the Neches River. In response, the only avenue offered by the speakers to prevent further damming was through additional federal involvement using the "Wild and Scenic River" act. 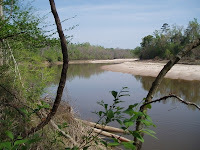 The perception of the audience seemed unanimous in that no one believed federal classification of the Neches as a "Wild and Scenic River" would do more than postpone the inevitable while, at the same time, open the door to future federal control over the river and surrounding lands. It appeared that everyone, including the speakers, believed federal control was not an option - one way or another it would be a fact. If attendee's had a prevailing attitude I would say it was one of disappointment but not defeat. Comments after the meeting expressed opinions that, at best, meetings like this (held in Lufkin) were to: (1) inform locals that the only possible alternative to continued damming of the Neches River was to have the Neches designated as a "Wild and Scenic River"; (2) enlist local support to spend significant taxpayer dollars on a "Wild and Scenic River" study and (3) inform locals that after the study is complete and the taxpayers money spent the federal government will ultimately make the final decision. If the intent of the meeting was to offer a solution it did not. If the intent of the meeting was to garner support for designating the Neches as a "Wild and Scenic River" - well, I expect those that were unsure are still unsure or are now non-supporters. If the intent of the meeting was to solidify Texans support against federal involvement with our "instate" rivers and streams, I would say it was an unqualified success. I went to the meeting as an uninformed observer, completely unaware of any political undertones involved or that the meeting had anything to do with stopping future construction of dams on the Neches River. 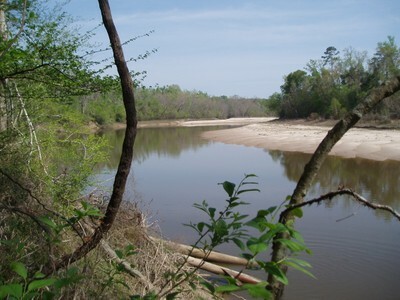 However, I am no longer uninformed regarding the designation of the Neches as a "Wild and Scenic River". Now, I know I cannot support such efforts - even at the cost of additional dams on the Neches River. With a dam most of us understand the process and have some realistic expectations, dismal though they may be, of what will be lost and gained both now and in the future. As presented, my interpretation of the "Wild and Scenic River" approach offers no guarantees, makes no promises, offers no formal provision for dispute resolution, costs money from the very beginning (taxpayer dollars for the study and local money if approved), and if approved will ultimately give control of the river and surrounding lands to the federal government. I heard no denial regarding the possibility that a federal dam might come later. A lot of what was said went over my head, but what little I did understand was more than enough for me. Before it was over, I half-expected one of the speakers to say, "We can offer no promises or guarantees, but you know you can trust us." In the meantime, my support will be for a Texas "Initiative" directed toward the prevention of further damming of the Neches - without federal involvement. As a history buff, considering Texas was a Republic at the time and under the circumstances Texas was admitted to the Union, a convincing argument might be made against any federal involvement with rivers, etc., which begin, totally flow, and end within Texas borders. It certainly seems worthy of further investigation - perhaps even our own "town" meeting though, as a senior citizen, I doubt I will see any result, regardless of the decision ultimately made or who makes it. As I expected, it seems the Feds are going to have a tough time selling local landowners on the "Wild and Scenic" designation. Historically, the people of East Texas have viewed any Federal actions suspiciously. I suspect the current political climate has made the locals even more wary of the Federal Government. 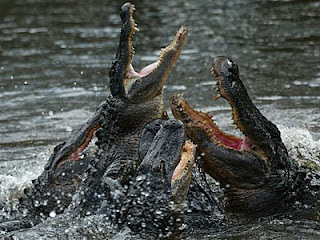 Below is some fascinating video of hundreds of alligators engaging in what has been described as a feeding frenzy. The amazing video was shot by fisherman Ray Cason at Stephen C. Foster State Park in Georgia's Okefenokee National Wildlife Refuge. 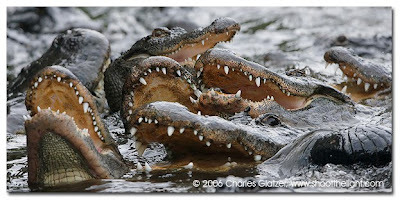 The gators were congregated in a boat basin, or canal, which leads from a boat ramp to Billy's Lake. Cason witnessed the gator gathering on two consecutive mornings. Each time the "frenzy" lasted 30-40 minutes. "There were 10-foot gators with their entire bodies three feet above the water. Gators rolling all over themselves. It was foggy that first morning (Saturday, July 10) but I bet there were 300 gators I saw in that boat basin and canal," said Cason. Wildlife biologists seem to be split on whether true cooperative feeding was taking place. 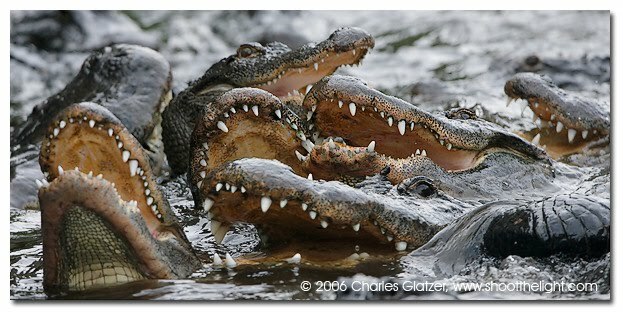 Cooperative feeding implies that the alligators were working together in some fashion to round up and capture prey. This behavior is seen with other animals like wolves, lions, and even whales. Other experts believe that there was simply a lot of prey, mainly bowfin, gathered in the boat basin each of those two mornings. A congregation of prey that thick was bound to attract a lot of attention from the dominant predator in that ecosystem. Whatever the case, there were a whole lot of alligators going at it in a very tight space. I grew up in SE Texas where there is a very healthy alligator population but I have never seen anything like this. I do know that trying to navigate that writhing reptilian mass in a small aluminum jon boat would be pretty nerve wracking. It is not something I would recommend. The Okefenokee is very similar to some of the marshy/swampy areas of SE Texas and Louisiana. I would be very interested in hearing from anyone who has observed this sort of behavior in our neck of the woods. You may recall that last week I and two other TBRC members spent Monday-Wednesday in the field near the location where possible sasquatch tracks were located last spring. While nothing of significance occurred as far as our search for that ever-elusive North American ape, we did have several odd experiences. You will remember that we spotted what appeared to be a feral donkey strolling across a remote forest road and had a late night "visitor", a bright shining light, approach our camp between 1:00-1:30am one night. It seems the weirdness continued after we left. A second team of TBRC members arrived in the area on Thursday 7/22. They spent their first day and night in an area about 30 miles east of our last location. They did some night hiking and call blasting but did not hear or see anything interesting. The second day and night they moved to the area where we had camped earlier in the week. They scouted the area and walked creek beds looking for sign but had no luck. So, like us several days before, nothing sasquatch related was seen, heard, or found. That isn't to say nothing of interest was observed. While leaving their camp the second day they ran into a familiar face. It seems they bumped into the same feral donkey we ran into earlier. 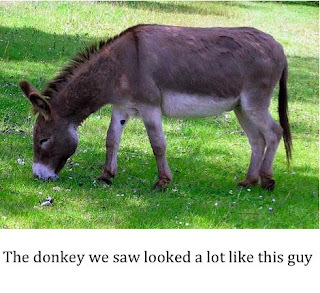 They managed to snap a couple of photos of the donkey thus confirming our sighting from several days before. Not the unusual animal we had hoped to concretely document but you take what you can get, I suppose. 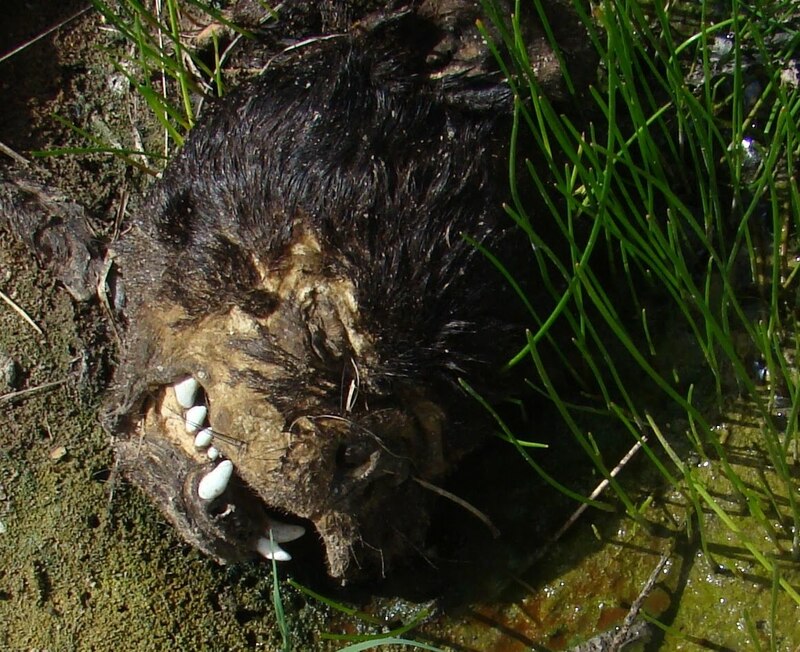 The strangest thing the team ran across; however, was a severed dog head (photo below). Just the head. No body was found. Initially, the team was excited as the head looked ape-like upon first glance. They were disappointed, and more than a bit disturbed, once they realized the severed head was of canine origin. Again, no body was to be found. What happened here? Who or what did this? Why? More questions without answers from the wilderness of the Lone Star State. 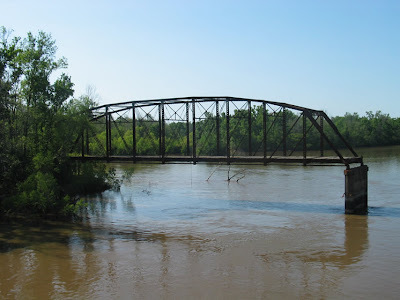 I reported yesterday that there will be a meeting in Beaumont where officials will meet the public to discuss the possibility of the Neches River receiving the federal Wild and Scenic designation. There will be a second informational meeting in Lufkin this Tuesday the 28th to discuss the issue. Anyone interested in what it would mean for the area if the Neches receives the designation is welcome to attend. 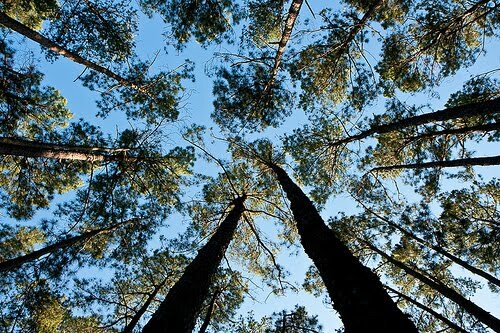 Attila Bality of the National Park Service and Deborah Caffin of the U.S. Forest Service, the same two speakers who will be at the Beaumont meeting on Monday, will be speaking in Lufkin on the matter and will take questions from audience members. The meeting will be held at 6:00pm Tuesday in the Lufkin City Council Chambers located at 300 East Shepherd, Room 102. I would very much appreciate a report on how the meetings went from anyone who is able to attend. 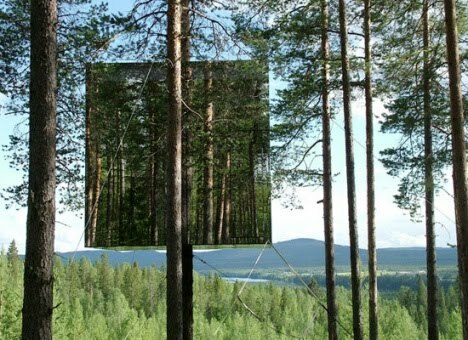 Here is a link to an interesting article about the successful completion of a nearly invisible tree house in Sweden. Actually, a series of six of these units were built as part of a "Treehotel" 40 miles south of the Arctic Circle. You can read the details here. 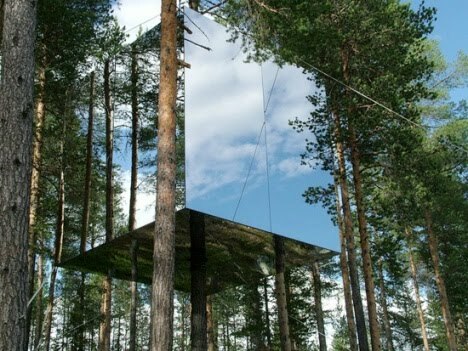 The concept for the "invisible tree house" was first publicized a couple of years ago. Several members of the TBRC discussed the possible uses for such a structure at that time. 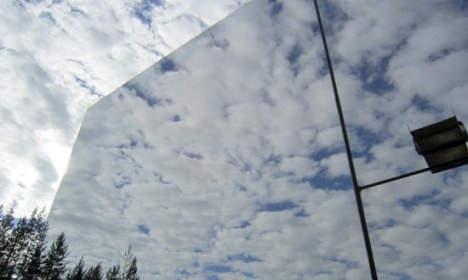 We felt that the potential for a small version of the unit as an observation blind would be great. It is true that in most animals the sense of smell is much more developed than their eyesight. I'm not sure the "invisible tree house" would be any more effective than a normal blind or stand as far as masking the scent of an observer. Primates are different though. The sense of smell in primates is not nearly as highly developed as it is in other types of animals. Primates rely much more heavily on their sight to find food or identify danger. If the sasquatch exists, as I believe it does, it is undoubtedly a primate. That being the case, it seems logical that they rely more on sight than smell. If true, the "invisible tree house" might be an effective tool in getting a glimpse of these creatures. I would think the cost of such a structure would be too steep for most of us; however, I'm guessing a simplified reflective box could be built by some sufficiently motivated and inustrious individual. Anyway, I found the concept interesting then and still do now. I would be curious to hear if anyone out there has attempted to build anything even remotely similar. There will be an informational meeting in Beaumont this coming Monday July 27th in regard to the possible designation of the Neches River as a federally protected Wild and Scenic River. Anyone interested in what it would mean for the area if the Neches receives the designation is welcome to attend. Attila Bality of the National Park Service and Deborah Caffin of the U.S. Forest Service will be speaking on the matter and will take questions from audience members. The meeting will be held at 6:00pm at the Dishman Art Museum located at 1020 E. Lavaca on the Lamar University campus. The museum is located just off MLK Drive. The woods of East Texas are a very strange place. Through the years, I have come to realize that there is just no telling what you might run into out there. I spent Monday through Wednesday of this past week out in the field and, once again, the trip had its share of weird moments. Two other TBRC members had arrived on Sunday and established base camp at the same location we used on our last trip. The campsite is very remote. It is certainly not the kind of spot you get to by accident. To give you an idea, to get to the site you have to turn off a two-lane farm to market road onto a rural gravel county road. After driving several miles you have to turn onto a very seldomly used and deeply rutted red dirt road. From there you have to travel a good ways before turning off onto what I believe to be an old fire road. This fire road is very easy to miss and is almost grown over in spots. It is also a very tight squeeze for a full-sized pick-up to wind through the pines (hence my broken side-view mirror on the last trip) to a spot where the fire road runs out. It is at the end of this fire road that we established our camp. Once camp was established, a fourth TBRC member joined us and the team was complete. We were stuck in camp Monday afternoon as a thunderstorm blew through the area. Once the storms passed, we geared up for a night hike. This is a technique we tried the last time out with some interesting results. While we did not succeed in catching a glimpse of our target species that night we did hear several long, powerful howls. These vocalizations, in my opinion at least, did not sound like a coyote. They were just too long in duration. In addition to being cooler at night, the night hiking enabled us to walk up on several types of wildlife, by using sound discipline and red lights only, that I don't think we would have been able to get close to during daylight hours. The night hiking also makes the chances of running into other humans practically nil. So, we resolved to try it again this time around. We left camp about an hour before dark and the weirdness began. We were driving to our entry point, about a mile and a half from the spot where possible sasquatch tracks were located back in May, when a large animal came strolling out of the forest on our left. The animal nonchalantly crossed the road and dove into the brush on the opposite side of the road. It was not a creature we were expecting to see. It was not a hog, bobcat, coyote, or deer. It was a donkey. Now keep in mind that we were miles from the nearest residence of any kind. I am aware of feral cattle roaming the woods of East Texas but have not heard the same thing about donkeys. If the donkey was domestic it had wandered a very long way from wherever home used to be. Certainly this was not the species we were searching for but it was an unusual sighting nonetheless. We proceeded to our target area and began our hike. It was miserably humid and warm. We were soaked to the skin within minutes. The hike covered about six miles total through the forest. We walked portions of abandoned pipelines, logging roads, creek beds, and game trails. The night was unusually quiet. We heard nothing unusual at all. We didn't hear much period, as a matter of fact. No coyotes, just a couple of owls, and one irritated fox. We saw even less. We returned to base camp and sat down in a circle to discuss the hike, make plans for the next day, and take in some much needed fluids. 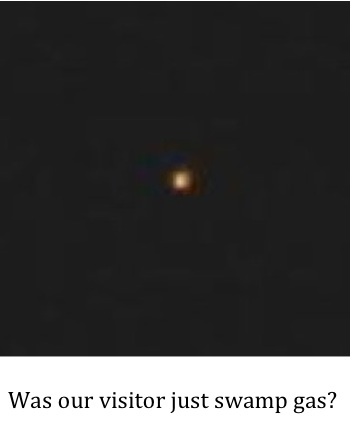 It was about 1:00am when we spotted an odd light bobbing through the trees approximately 100-150 yards outside of camp. The light moved to the left and then back to the right and seemed to be slowly getting closer to us. Keep in mind the remoteness of our location. There was only one way in and we would have heard and/or seen any sort of vehicle as it passed the fire road that led to our camp. There are no roads or trails leading to the location so it seemed unlikely that a hiker had stumbled into the area. Plus, other than us, who would be out hiking at 1:00am? We couldn't imagine what somebody was doing out there but figured there was at least a possibility they were up to no good. We killed all light in our camp and waited to see what would happen. Curiously, less than a minute after we killed our lights our mystery light also winked out. We waited up for quite a while to see if it would reappear but it never did. One of our group woke up early the next day and walked out to the general area to see if he could locate any sign of our visitor. He found nothing. One thing he did figure was that our visitor might have been even closer than the 100-150 yards originally estimated. He felt the light was too bright and clear to be that far away from us. The area was simply too heavily wooded for a light to show as clearly as it did from more than 75-100 yards away. Our mystery light source puzzled us greatly and unnerved us slightly. We all decided that one mystery at a time was plenty and have now chalked up our mysterious visitor to the general weirdness that seems to be par for the course in the deep woods of Texas. We broke camp on Wednesday around noon and the guys headed home. I made one more stop on my own, however, and visited the area where the mystery tracks were found last spring. 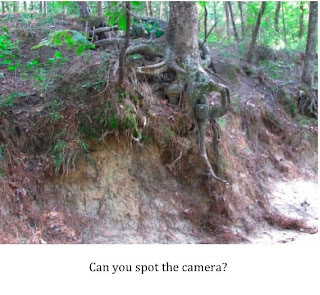 I placed a game camera in the creek bed and hope to find out once and for all whether our track makers were humans or sasquatches. The camera faces a bend in the creek so that whatever comes around that curve is going to get its picture taken. I am very excited about the location and equally pleased at how difficult the camera is to see. It blends nicely into the tree on which it is mounted and the wall of the creek. I plan on returning in 4-5 weeks to retrieve the camera. I am really looking forward to viewing the images. There should be all sorts of wildlife snapped as this creek bed is full of animal tracks. I've spotted deer, hog, coyote, raccoon, opossum, and, of course, those mysterious barefoot tracks in this creek. If nothing else, I should have some great pictures of those species. If I'm lucky I might capture a cat of some kind as well. And who knows? I might just get the shot that solves the bigfoot mystery once and for all. I trekked back to my truck and started to make my way home. I had not gone more than a quarter mile when two feral hogs darted across the road directly in front of me. They were dangerously close to becoming road bacon but didn't seem concerned as they trotted off into the forest. They were not very big. I would guess about 75 pounds each. Both were very dark to black in color. It was one more reminder of how you had best be paying attention when you are traveling the woods of the Lone Star State. There is just no telling what may decide to make an appearance. The trip was uneventful as far as anything sasquatch related; however, I can't say it was uneventful. Donkeys, mystery lights, and suicidal hogs all ensured that the backwoods of this particular corner of the state would keep its reputation for being a very strange place. So, now I have roughly a month to kill before checking on my camera. I will be publishing the analysis of the track castings taken from this area as promised weeks ago, reading up on some recent news stories, and catching up on correspondence. Hopefully, I'll have something very interesting to post in a month or so. I will be heading back out to SE Texas tomorrow. Several TBRC members will be staying a night or two each. All together we will have a presence in the area of interest for at least seven straight days. I, and at least two others, will be camping in the area Sunday-Wednesday. Other members will relieve us at that point. We will be revisiting the area where the possible sasquatch tracks were located back in May. I plan on deploying at least one game camera in the area this time around. I will leave the camera out for four to six weeks and see what happens. If nothing else, I'm expecting some good photos of the area wildlife. I will provide an update to our activities once I get back in the middle of next week. I saw a dark colored big cat today north of Dallas. It was on a rural road at dusk. We thought it was a dog walking down the dirt road at first. The closer we got the less it looked like a dog. We got about twenty feet from it and it turned into the brush. When it did there was no denying it was a cat. The tail was longer than the body. It was about the size of a big dog but lanky. It was black but very very dark brown. It seriously looked like a mountain lion. 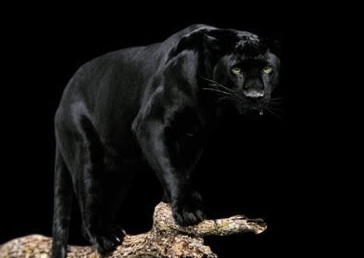 I have never seen a panther before to compare. It did not seem to be very afraid of the car but we weren't going very fast. 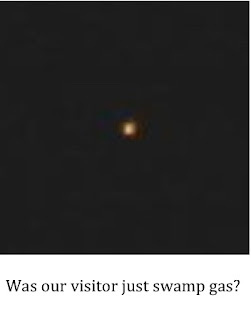 I have found other similar posts of sightings in the area. The text above was actually received as a comment to another post about big cats in the Dallas area. No other details were provided and I have not heard anything else from the poster of the comment. I would really like to hear from whoever posted this comment and get a few more details as to where this sighting occurred. If anyone has details on this I can be contacted at Texascryptidhunter@yahoo.com. If the witness did indeed get to within twenty feet of the animal, there would seem to be little chance of misidentification. The statement saying the tail was as long as the body would seem to rule out any sort of canid, like a coyote, as well as the bobcat, the most commonly sighted big cat in Texas. The color would seem to rule out a bobcat as the culprit as well; however, it must be acknowledged that trying to identify the color of a moving animal at dusk can be tricky business. The anecdotal evidence that mountain lions are making a strong comeback through out the state continues to mount. The stand the Texas Parks & Wildlife Department continues to take, claiming that the sightings are all misidentifications or escaped pets, becomes less tenable weekly. What to make of the large black cats being spotted is something else all together. 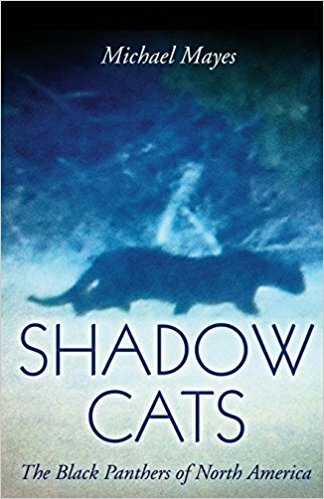 Theories range from the jaguarundi being the culprit to the possibility of a large unknown melanistic cat existing in the Lone Star State. As time goes by, I am becoming more and more convinced that there is some kind of large black cat out there. 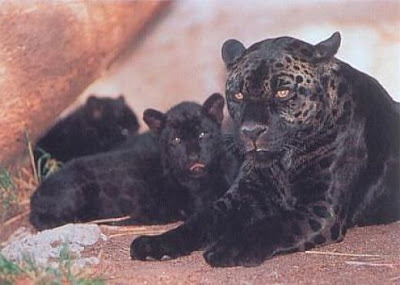 I personally know two people who claim to have seen black panthers in east Texas. I have another friend whose father says he saw a large black female panther with kittens crossing a rural road (also in east Texas). I firmly believe there is a biological basis behind these sightings. That being the case, it should be possible to obtain a photograph. If you are a landowner who has seen a large cat on or near your property and wouldn't mind my placing a few game cameras on your place please contact me at the email address previously given. If a photograph can be obtained maybe we can figure out whether they are wild or escaped pets (if tawny colored) or just what the heck they are (if black in color). I would love to slap down a photo of a black panther on the desk of a TP&W official. I suspect a lot of people would get some satisfaction from that as well. I thought I would post an update just to let everyone know that I am alive and well. I have received a couple of emails asking if I was still going to continue with the blog and if everything was ok.
Everything is fine. I just decided to take some vacation. I am actually pretty proud of myself. I put my cell phone and laptop away and didn't fool with either of them for about two weeks. I must admit to having some withdrawal the first day or so but quickly began to enjoy my technology sabbatical. I have spent a lot of time with my family. We took in the show Wicked in Houston this past weekend. I highly recommend seeing it if you get the chance. Simply terrific. I also saw a couple of movies with the kids. Toy Story 3 gets an A+ while the Karate Kid gets a C+, in my opinion. I have also been doing some reading. 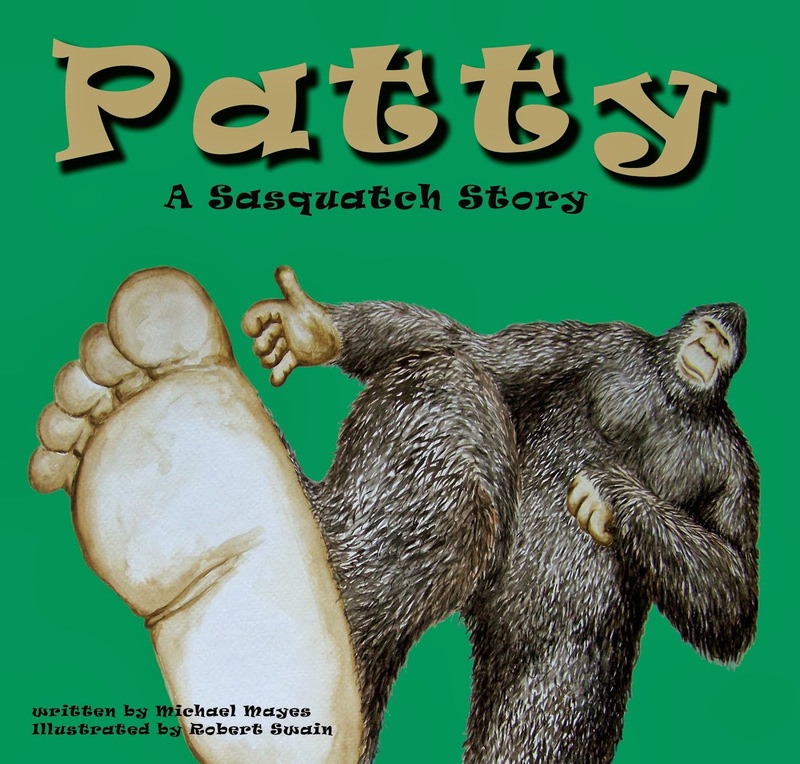 I really like reading the classics but I couldn't tear myself completely away from the subject of cryptozoology. So, I compromised and started reading Gulliver's Travels. If you are confused as to how Gulliver's Travels relates to cryptozoology I will clear it up for you with a future entry shortly. It is really quite an interesting connection. There has also been a fair share of yard work, some pretty mediocre golf, and an unsuccessful attempt to get into the World Cup. I realize that the rest of the world is simply soccer crazy but I don't get it. My theory is they only like it so much because they don't have the NFL or MLB. I really want to keep this site up and running for a long time. However, judging by the number of sites that have come and gone just since I started, that is easier said than done. So, I decided that the moment I felt like writing it had become work or felt stressed to get an update of some sort online simply because a few days had passed since my last entry I would back off and take some time to rejuvenate. Hopefully, doing so will help me avoid burn out. I appreciate those of you who have emailed expressing concern. I plan on getting back to all of you soon. Be patient with me as I am behind in my correspondence. Just know that all is well and I plan on ramping things up again ASAP.